Welcome to Malibu?s one and only dispensary. Located just south of the world famous Malibu Pier and surf rider beach and north of Nobu and above Zuma Jay?s surf shop in downtown Malibu. We carry the highest quality top-shelf organic strains, Malibu top-shelf locally-grown strains, top-shelf CBD flowers and products (including Rick Simpson Oil and Magic Potion) smoking/vaping accessories, concentrates and a extensive selection of edibles, including organic vegan and gluten free options. 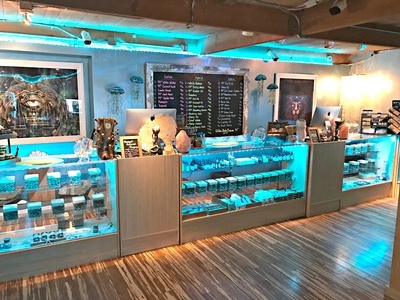 Not only do we carry Malibu?s finest medicine, but we also hold space as a transformational boutique, carrying Malibu locally created art, crystals, healing elixirs, visionary art, fashion, superfood products and other higher consciousness products. We also offer complimentary massage, sound healing, breath work and Reiki for our patients in our healing cove. Our entire team is here to help you?.from our knowledgeable cannabis consultants to our drivers, we want to know your concerns and how we may relieve your ailments. Take the natural approach with our medicinal Marijuana to calm your anxiety, relieve stress, regain your appetite, and get some much needed sleep. We can also help you alleviate pain and reduce muscle cramps and feel general relief from anxiety, spasms, insomnia, irritable bowel syndrome, PTSD and many more. Choose from a wide selection of different strains and edibles available to you on our menu.